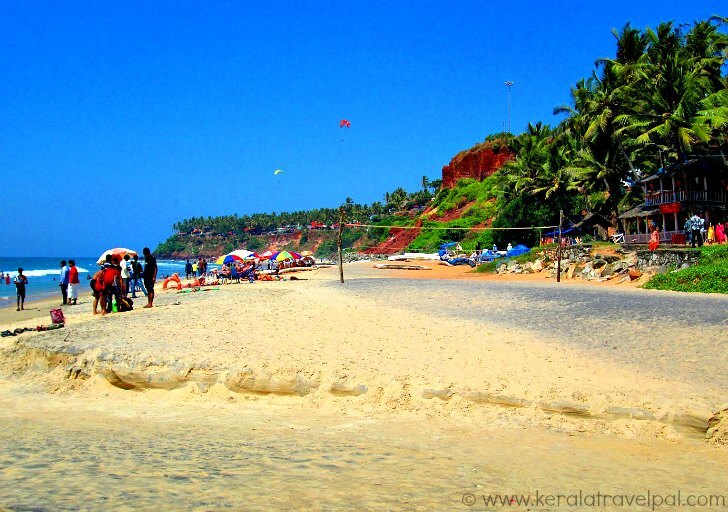 Many tourists consider vibrant Varkala beach as a viable alternative to Kovalam. Cliff clad beaches and pretty vivid surroundings set a nice joyous feel attractive enough to spend a few days here. Varkala’s uniqueness is the beauty of its peculiar landscape. The land, at a significantly elevated level than the sea, forms a wavy cliff for a long stretch of more than a kilometer. The cliff’s edge provides breathtakingly beautiful view of sea and sand. It takes 50 or so steps to get to the beach that lies well below. There we find one of the best beaches in Kerala, as a fine stretch of sand gorgeously spread between the red cliff and the sea. The cliff harbours 20 or so restaurants and an even greater number of shops selling anything from carpets to curiosa. Fine resorts in addition to Ayurveda and Yoga places have also sprang up in this one kilometre stretch. The prominent Sree Janardhana Swami Temple is situated near cliff edge, as well. 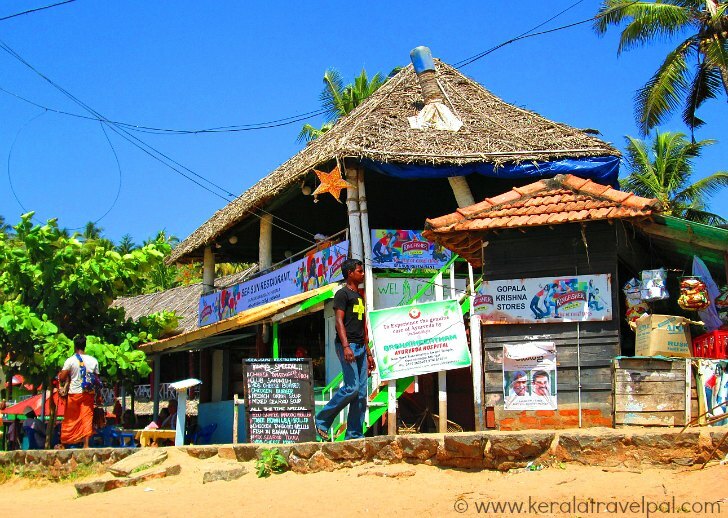 Varkala is popular with both locals and tourists alike. For Hindus, it is a sacred place often included in their pilgrimage list. Tourists, on the other hand, are happy to discover several engaging activities for a few days of fine leisure. The sandy shallow beach is popular for swimming and sunbathing. For water sports enthusiasts, scuba diving, parasailing and wind surfing are available. While swimming, though, be aware that at times the sea throws some nasty strong under currents. So a watchful eye over kids is necessary. Wider choice of alternative activities that can be perfectly combined with relaxed Varkala beach holidays is a huge plus. Ayurveda and Yoga deserve mention along with the renowned local massage. Varkala sightseeing is a great experience, thanks to scenic surroundings such as Kappil backwaters. Beach side restaurants are perfect places to settle with some Chai and a book. Or else simply indulge in some great food. Eateries which let you select from displayed fish and then promptly grill it right in front are quite popular. The cliff top is a favorite hangout place for tourists throughout their holidays in Varkala. Papanasham beach - the main beach at Varkala - has two sections. The northern part is the tourist’s beach. It is often busy yet not overcrowded. The beach at southern end has a path leading from the Temple just above. According to Hindu beliefs, a wash there is highly sacred that it removes the sins the person has committed. Hence the beach is named Papanasham, which means destroyer of sins. People visit here to conduct last rites for deceased beloveds. Consequently many people are emotionally connected to here. Similar to Benares, the cremated ashes of dead are scattered in the water here. Therefore the place is also called Uthatra Kashi (Southern Benares). Regardless of ashes activity, the beaches are considered suitable to swim. Sree Janardhana Swami temple has its origin dating back to a respectable 2000 years. The deity here is Lord Vishnu. The temple attracts large crowds for the sacred event of Vavu bali, held once every year. It is a unique event limited to just this temple and so draws people from far and near. 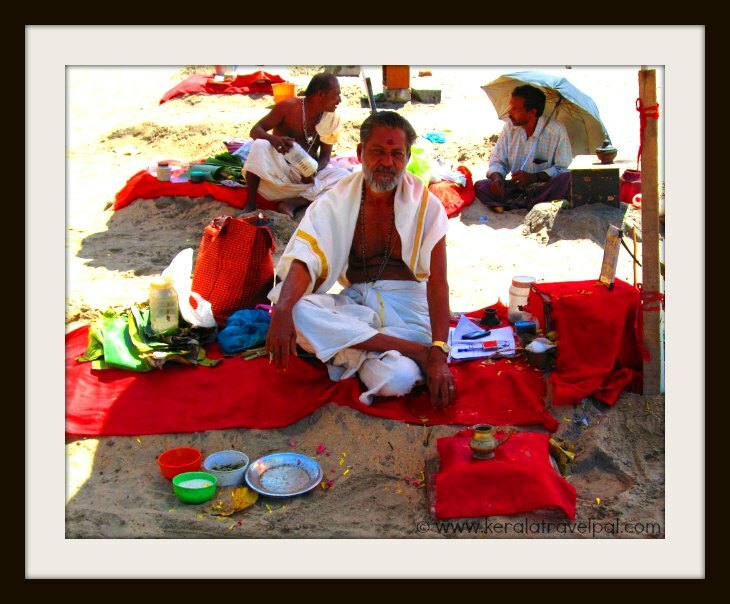 Rituals are offered for ancestors to help them out in afterlife. There is also a smaller beach at Varkala not too far from the main beach. It is at the far northern side, near the coconut groves in the vicinity of the area where the cliff ends. The distinct feature of this beach is the black sands and so is called black beach. There are several mineral springs at Varkala. The water in those springs is believed to have medicinal properties and even draw people to take bath in them. Varkala has a special place in Kerala history as the action place of Sree Narayana Guru. He was a social reformer well ahead of his time. Born in a lower caste family, the sage bravely worked against the higher caste oppressors and ultra orthodox segments. His work massively changed Kerala social life in the last century. It was his efforts that forced authorities to open Temples for lower caste Hindus. Established as a hermitage in 1904, the Mutt on top of Sivagiri hills attract thousands of devotees. Many devotees visit Sivagiri Mutt, the final resting place of Sree Narayana Guru, wearing yellow clothes. The South Keralan town of Varkala lies approximately 54 Kilometers north of Trivandrum City. Kollam town is about 37 Kilometers further to the north. Varkala town and beach are at a 10 minutes driving distance apart. Railway Station : Varkala Railway Station at 3 Kms. Well connected to other towns/cities. About 20 trains stopping here per day make travel to Varkala easier. Food Options : Several restaurants on Varkala beach cliff top. Best time to visit : September till May. Can be visited throughout the year, heavy monsoon rain (Jun-Aug) can severely restrict travel plans though. Nearby Attractions : Sivagiri Temple/ Mutt, Janardhana Swamy Temple, Anjengo Fort Varkala, Varkala Tunnel, Ponnumthuruth Island, Kappil backwaters, Neyyar Dam, Agastyakoodam, Ponmudi Hill station, Ananda Valleeswaram Temple, Thirumullavaram beach, Thangasseri beach, Ashramam Picnic Village, Mahatma Gandhi beach and Kollam town (Shopping & food).